Gigacord ClothARMOR USB Type-C 24-pin Charge/Sync Cable w/Strain Relief, Cloth Braiding, Ultra Slim Aluminum Connectors, 1 Year Warranty, Rose/Black (3 - 6ft.) - NWCA Inc.
Type-C Charge & Sync Compatibility: USB Type-C connectivity makes for a variety of compatible devices such as MacBook, Chromebook Pixel, Galaxy Note 7, Samsung Galaxy S8, Nokia N1 Tablet, OnePlus 2, Nexus 5X, Nexus 6P, Xiaomi 5, LG G5, Samsung Galaxy TabPro S, HTC 10 and more! 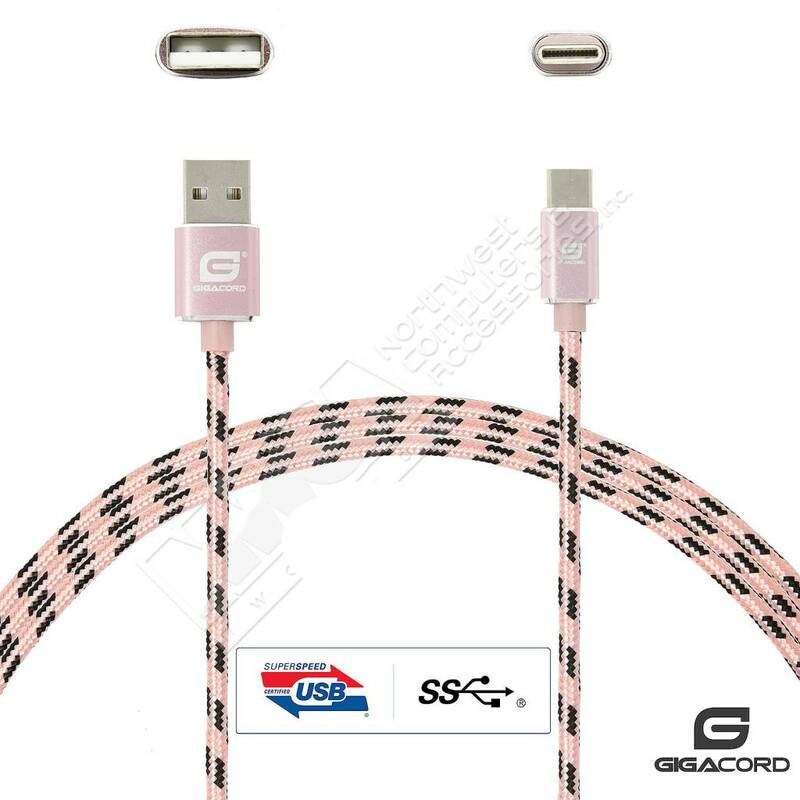 The Gigacord ClothARMOR cables ensure a lifetime connection for fast charging and high speed data syncing capabilities for a variety of Type-C enabled devices. Durable Cloth Braiding: Sturdy cloth braiding guarantees Gigacord ClothARMOR cables for 1 year enabling over 4000+ bends. This durable cloth braiding is a premium and tangle free design for peace of mind when storing. Ultra Slim Aluminum Connectors: Ultra slim connectors fit cases of all types with ease. Thick cases are no match for our ClothARMOR cables! The aluminum construction also provides durability for a solid connection everytime.